This happens many times to me: I search on Google for a problem I’m having with my computer, click on a search result, reach the site (most of the time, it’s a forum), and boom! I have to register in order to view the solution on the page. Or worse, on some occasions, they want me to pay them to view the page. Aibek previously covered How To Access 'must signup to read...' type Websites without Registering How To Access 'must signup to read...' type Websites without Registering Read More Bug Me Not which is a wonderful service that provides disposable login details for most sites and forums. 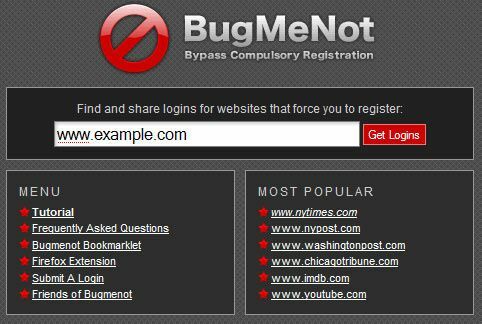 You could use those IDs and passwords to login – bypassing compulsory registrations. Most of the time this should suffice, especially for popular sites. There’s also a Firefox extension available. If the snippet near the result seemed to talk about the problem you’re having, there are high chances that Google Cache should have a copy of the website you landed on. One of the sites where it works quite well is ‘Experts Exchange’. Instead of clicking on the direct link, just click the ‘Cached’ link near the search result. View the page. Go till the end of it. You might end up finding the information there. In a rare case when you’re not able to view the solution even by accessing the Google Cache, you can use Be The Bot. Be The Bot fools the site to thinking that Google Crawler Bot is accessing it. And hence, you’ll get a view of the ‘real’ site via Be The Bot. What other ways can you think of to bypass compulsory registration forms in sites, especially forums? If you liked this article, please share it on StumbleUpon or Digg it here. I’d appreciate it. Where can I find out how peopl are able to bypass a pay-to-view restriction on my partner's website which hosts my documents ? A lot of customers have been able to do so but, the company are trying to suggest the customer who told me about it is exaggerating. Thanks for all these great solutions to a problem that has always bugged me. I can definitely use these and let my friends know about these. They will be very grateful. Thanks for Expert Exchange trick. I never heard of "Be the Bot" before, gonna have to try that out, thanks. Thanks now experts exchange will probably close that hole. bethebot.com is wading through shark infested waters. i dont think google, as magnanimous and open minded as it seems to be, is going to take kindly to random sites forging its headers. expect, at the very least, legal action leading to a court order to shut it down very soon. I don't think you have to worry about Google suing BeTheBot.com. After all, Internet Explorer (and it's not the only one) forges its headers to pretend to be a Mozilla browser. Great tips, there are more like them here. For Experts Exchange ... no fancy tricks are needed. The results at the top of the page are hidden, but the exact same answers are UNHIDDEN at the bottom of the page. Try scrolling down! It's because Google has strict rules about showing the googlebot a different page than regular users. But I still believe Google Cache might help you discover hidden info in a lot of other sites. Be the bot.... great stuff! Good tips - I've been using another method that you missed. Why reveal now? I'll write a post on it on MUO. Thank you for that timely piece of info. Be the bot...nice touch! I have tried mailinator before, and I really find these temporary email services very helpful. If you're using Firefox, you can also use the Firefox user agent switcher to pretend to be googlebot. You can also use this to pretend to be an iPhone, etc. Thanks, I've tried this extension before, but I totally didn't remember this when writing this article. Thanks for BeTheBot; I hadn't heard of that one. I also occasionally use the WayBack Machine at web.archive.org - I made a keyworded search for it.